Looky 4 HD Touch Screen Portable Video Magnifier - 2.5 Hrs. of Battery Use! 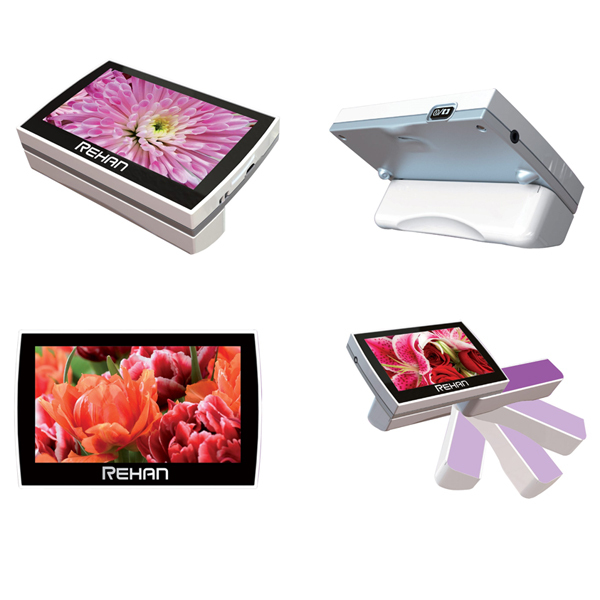 The Rehan Electronics Looky4 HD is a versatile and portable electronic video magnifier featuring an incredibly clear 4.3-inch TFT HD screen, 2 LED lights, and an easy to use touch-screen interface designed to enhance your view from 2x to 20x so that you can see texts and objects more clearly. The Looky4 HD has 12 display modes (including full color, black on white, white on black and several high contrast options) that you can view and select by swiping your finger up or down on the touch-screen interface, as well as a freeze frame mode that you can use to capture the text or image on screen while still switching display modes. There is also a built-in handle that also doubles as a stand for the Looky4 HD. Swing out the ergonomic handle and you have a handheld illuminated magnifier that you can easily maneuver, and when the handle is folded into the Looky4, just set the device onto a table and it will automatically stand at an angle to let the user read with stability for longer periods of time (magnification will have starting range of 8x when the Looky4 is used as a stand magnifier with the handle folded in). With its clear HD display, innovative and easy to use touch-screen interface and wide selection of magnification and viewing modes, the Looky4 is the perfect portable electronic video magnifier for anyone with low vision.